The California Department of Education has not formally adopted a college and career readiness definition. However, on March 3, 2014, the State Superintendent of Public Instruction announced that the Standards for Career Ready Practice are for all students. These standards, in general terms, describe what students need to know to succeed when they transfer to postsecondary education, career training, or the workforce. California allows students to enroll part time or full time at any community college for academic and/or CTE dual credit. Students in 11th or 12th grade also are permitted to enroll part time in classes at the California State University or University of California for academic credit. Courses are offered at high schools and college campuses (Education Commission of the States, 2015). A list of all articulation agreements can be found at the California Statewide Career Pathways website. The Foundation for California Community Colleges, Center for Native Education, Gateway to College National Network, Middle College National Consortium, National Council of La Raza, and Woodrow Wilson National Fellowship Foundation have partnered with institutions of higher education to provide 41 early college high schools as part of the Early College High School Initiative (ECHSI). 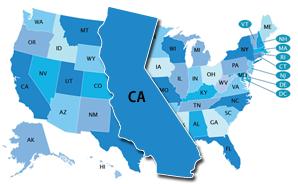 California does not have a statewide system for career exploration or career plans at the K–12 level. Each subject area listed above (e.g., English, mathematics, social science, etc.) is designated by a letter A through G. The A-G Subject Requirements align with the University of California system. Courses satisfying the A-G requirements must be approved by the University of California System and appear on a school’s course list. California may have a state-specific Early Warning System, but the system is&nbsp;not publicly available.